So two friends of mine, Rob and Jeff, were up in Canada checking things out, and saw signs for "Fort". Thinking they were for an actual Fort (the walled variety), they were disappointed when they didn't really find one, but instead they discovered the World's Largest Wagon Wheel and Pick Ax! 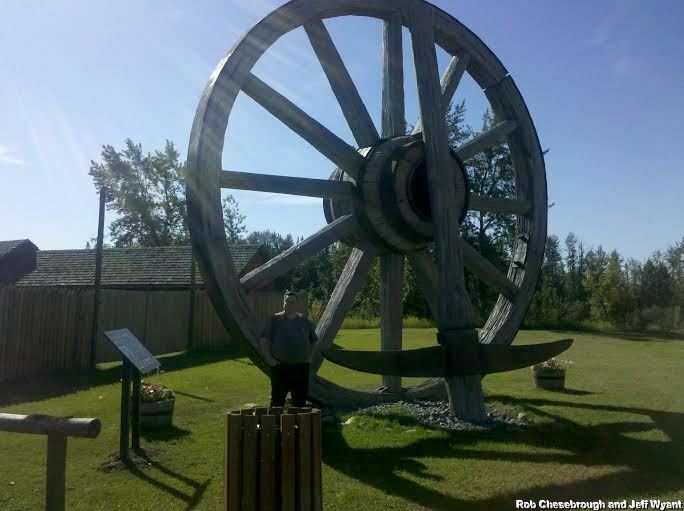 Located in the town of Fort Assiniboine, next to the Fort Assiniboine Museum, the World's Largest Wagon Wheel and Pickax were put up on July 20th, 2005 in honor of Alberta's Centennial. The wagon wheel is 24 feet in diameter (err sorry, roughly 7.3 meters, this is in Canada) and the pick ax reaches about 20 feet (just over six meters). Surprisingly the wagon wheel isn't even made out of wood, however. Instead it is constructed with a steel frame, and made out of hand carved foam, coated with some sort of weather coat and then painted with an enamel finish. The company that created it is Studio Y Creations located in Calgary, Alberta. Canada appears to play host to several of the "World's Largest" including the World's Largest Beaver, World's Largest Fire Hydrant, World's Largest Blue Heron, and World's Largest Lobster. Special thanks to Rob and Jeff for the picture and info on this location! For the purposes of this article, I guess in our URL, weirdca.com, the "ca" stands for Canada!